The following Personal Works are made with the supervision and technical advice from the prestigious University, research centres　and the leading consultancies as well as the engineers and the manufacturers. This urbanism project consists of the urban analysis of the site concerned(South East London), existent or in the proposal on the basis of varying dynamic urban elements such as transport, zoning, environmental or climatic factors, the site fabrics and the historical land use in consideration of both artificial infrastructures and the natural ones. Some of them are plotted into mappings of geographic information system(GIS). Moreover, the generative and decentralized models such as agents and voronoi diagrammes are employed in order to explore the spatial organization and the fabrics of the site concerned. They are not only already used models for most of the sophisticated computer software for the simulation and analytical tools about urban projects but also visualize the hidden or kinetic phenomena of significant factors around the area analyzed. All this will lead to forming the novel or emergent spatial configuration in relation to a local context and contribute to formulate the urban intervention required. The city fabric of Barcelona is thought to be characterized mainly by the seaside areas on the south and the mountains in the North and the urbanized city assets. As one of the major touristic destinations in Europe, the landscape and the urbanism in the city are very design led and are encouraged to involve the cultural architectural assets whose city-scapes are characterized by cellular districts called as ''ensanche celda'' and the terrains(ceramics) and the stones. ecosystem and the Eco-friendly comfort in a district within the above ensanche celda. orientation and the architectural use of formal typology like rectangular blocks which are composed of 5 patterns of interior layout,the office and commerce spaces on the ground and the 1st floors. Experimentally, those blocks are clad with different facade systems, each with its own paradigmatic design with excess and recess for the volumetrization of the facade and enmeshed use of the curvilinear partitions and the RC grid frames. Moreover, the roof level(RF) of each of building blocks is transitable with the green turf which gives an integrity of the green areas with their surrounding areas. The site plot sets to be a bit site less or neutral. 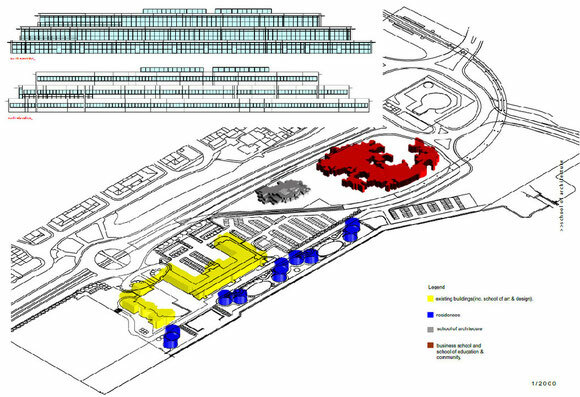 The planning expects to be made irrespective of the differentiated macro site conditions. 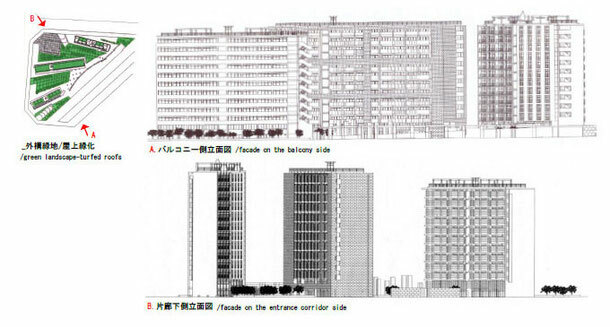 up to near 10m intends to be planned in consideration of the environmental design and the passive principle with the low energy consumption within the highly dense area. which are of architectural planning or conditions. These are mitigated constraints in consideration of the trade off theory. Thus, finally, the offspring objects are created and one of the apparently the most suitted objects to the criteria set up is selected and transformed into the final housing. 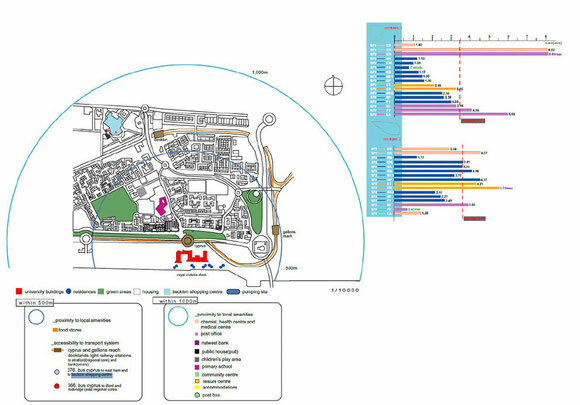 The Sketch up is used to tranform the abstract model into the final building model, 3 dimensionally and on the basis of relevant factors for the Building Information Modelling.(BIM). -The Wall Reinforced Concrete(WRC) sandwiched by rammed earth finishes with the limes(and cements) on both interior and exterior faces. -The frontal entrance side is north facing with the long vertical and horizontal slits whilst the south facing part is in principle surrounded by the peripheral buildings but contains large openness for the intake of the natural light and air. -The frames of that openness are made of wooden plywoods pursuing the through use of the ecological materials. on the basis of the raum plan, decimal spaces of Adolf Loos. This project is carried out in the terminal node of the East london dockland area. Our meshed surface object is created by the Genetic Argorithm and is transformed into the prototypical bus gate plotted in the above area. Key features of this multidisciplinary project are as follows. -The East London area corresponds to one of the most prominent regeneration projects ever made in the UK history and has a plentiful of the infrastructures with the formal richness and hosts the 2012 Olympic Games. -Originally, the meshed surface object is created by the body plan or sequential sectional plans and the constraints based algorithm which are key notions to represent curvilinear or blobby forms and biological body plans with adjustability under certain conditions which are theorized by Oxford computer scientist, Richard Darwkins. Finally, it is transformed into the envelope made of more structurally strong form like crossed meshes as the final bus gate envelope. the consultancy department of the major Steel maker, Bending manufacturing makers and the neoprene suppliers. monocoque envelope expects to be planned. -The process of making this prototype is based on CAD/CAM process. In this process, we have experiences of integrating the design, the fabrication and the construction in a seamless or overlapping process. This is the first part of the architectural application of the termite algorithm in my research work activities. The termite algorithm is the computer algorithm modelling and simulating the termite, one of the social insects or coordinated animal models whose properties such as separation, alignment, cohesion and bump-off, are thought to be very effective to reproduce interesting spatial organizations and configurations even in the architecture domain. interact locally with one another agent and with the environment or conditions. 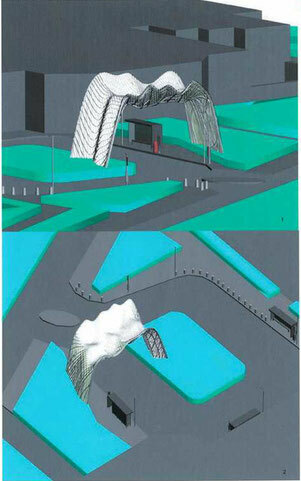 All this also is very effective notions to reproduce interesting architectural objects. Key features of the project are as follows. factors such as accessibility, environmental factors,the human movements and the users' requirement. -The constrained termite algorithm with rules formulated is run over longer hours in a day within one week in order to create the abstract building bodies visibly self-organized. building block with the passive principle. and configurations of the building blocks. -The final building block is completely of low energy and eco-friendly design. >The sustainable RC walls and slabs with highly thermal mass. >natural ventilation like cross-ventilation and mixed ventilation. -The lighting fittings and mechanical equipment used are low energy lamps, re-use of the produced heats.